This is well said by Ayn Rand and the one who knows when to take “the step” is the real-time opportunist (in a positive way). Same goes with one of our trainees who believe that there are numerous opportunities available if you look around. All you need to is to understand the requirement and act accordingly. Meet Digiperformer Swapnil Mishra, one of our brilliant trainees who believe there are lakhs of job opportunities in the digital marketing industry and currently working as a Digital Marketing Executive in one of the startups of India as well. In chit-chat session, he shared why he believed digital marketing is one of the hotshot industries to look after when it comes to shaping your career and how Digiperform helped him to give a start just after completing the advanced level digital marketing course. Swapnil: I am an English honors student from St Xavier’s College Ranchi and have completed my digital marketing training from Digiperform. Currently, I am working for EaseMyMatch – a Noida based Startup as a Digital Marketing Executive. Swapnil: The future calls for digitalization and businesses as well consumers are completing inclining towards it. This has led to lakhs of job opportunities in the market and these numbers are just going to increase in the upcoming years. This inclination and abundance of opportunities made me believes to follow the industry and grace my career with it. 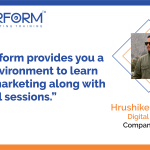 Swapnil: As per my experience, there are two factors that make Digiperform stand out in the crowd i.e Dedicated Team of Trainers and A+ Grade LMS Content. Swapnil: The moment I enjoyed and admired that most were – the one to one doubt clearance sessions. The trainers were very supportive during the classes and arranged special doubts session for my match as well. These interactive sessions have been my favorite experience while learning. Swapnil: Yes, I do. Firstly, they have great content for training and provide complete guidance during your training sessions. Even, trainers share their personal experiences as well as case studies to clear your doubts and help you to understand the online marketing process. Secondly, they are one of the biggest names when it comes to digital marketing training, with 30 + centers running all over India and more upcoming. No doubt they are Asia’s Best Institute when it comes to digital marketing. Swapnil: I would give 9 out of 10 in scoring. Swapnil: I want to be skilled enough to handle multiple domains and at least where I can initiate a startup of my own up as well as running it. Swapnil: Learn – Apply – Fail – Learn. These are basics for everyone for any industry. Plus, take an initiative to use your learning in your own ways. Be experimental. Swapnil: Digiperform is more than just an ordinary training institute. Thanks, Swapnil for sharing your valuable experiences and loving Digiperform so much. We wish you a great success in your future endeavors.